At various times in my life I have turned up my nose in disgust at carrot cakes. Seriously. Carrots? Those are a vegetable and I love them – they do not belong in cake. I compartmentalize my food. If I’m being “bad” and eating cake, I don’t want to mix up that emotion with the “good” of eating a vegetable. I’m not adept at sorting out that many contrasting feelings. However, I realized this week that I used to feel the same way about zucchini cakes – until I discovered that my mother’s chocolate zucchini cake (I’ll have to make that soon and post the recipe) is one of the most delicious things on the planet. So I decided to give carrot cake a sporting chance. It’s Easter week after all – what better cake to make? As per my usual, I started researching recipes. I think maybe I’m an information glutton. For whatever reason, I have to look at twenty different recipes before I decide what direction I’m going to take. I knew one thing straight off – no nuts. If you read my recipes with any regularity, you know my feelings on nuts in baked goods. “But!” you may say, “It’s different with carrot cake! You need the nuts! Especially on the frosting!” Nope, not gonna do it. I don’t care how amazing people say pecans are. I’m not soiling a moist luscious cake with the hard crack of a nut. Second, what is with the pineapple? About half the recipes I looked at have crushed pineapple in them. I’m sure that makes for a really moist cake, but pineapple is a pretty distinct flavor, one which I have a feeling would overpower the carrots. So, I went without them. I also said ixnay to the upidstay…um I mean raisins. 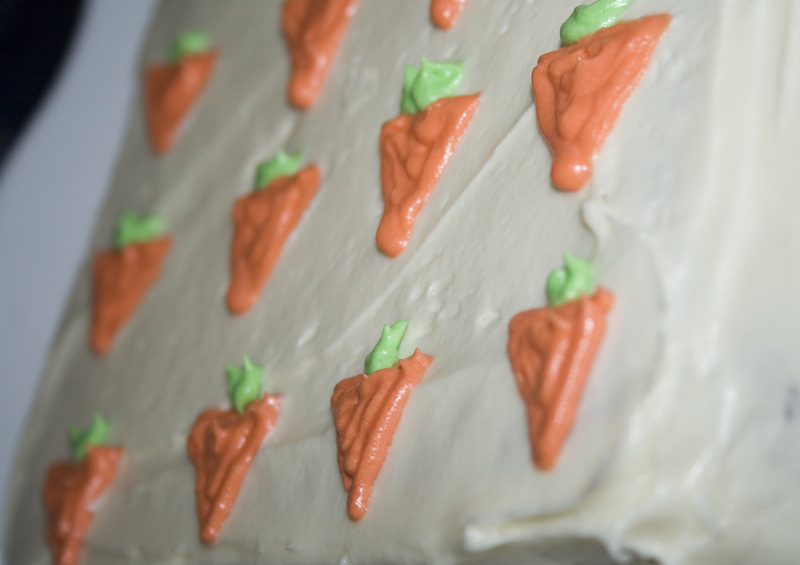 Ultimately, I wanted a rich moist cake with carroty flavor that wasn’t muddied up with a bunch of other hoo-ha. I also figured I might as well use applesauce instead of oil so that I could pass off the cake as “healthy”, which would help me ignore the fact that it has a decadent cream cheese frosting on top. 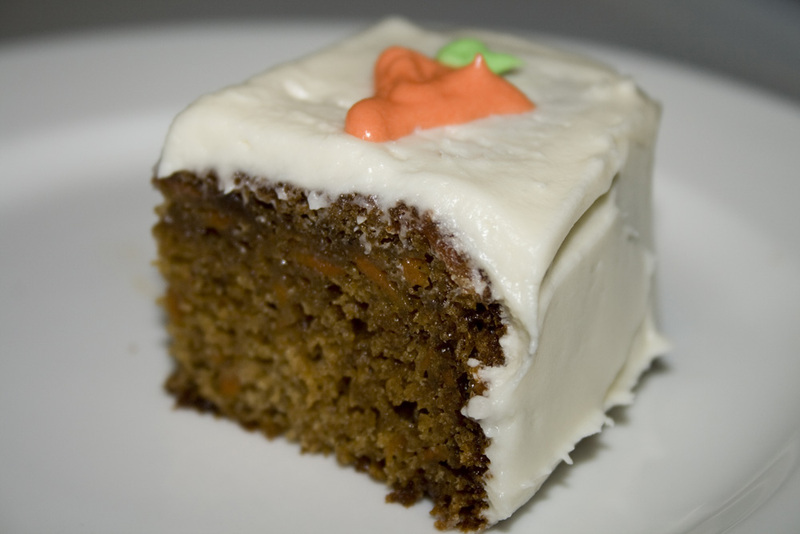 As a side note, why is it a carrot cake absolutely requires frosting it with little carrots? I tried not to, I just couldn’t help it. Seriously, why is that? We don’t frost chocolate cake with drawn on chocolate bars. Strange, but true. This cake turned out pretty delicious – you know, for a vegetable. In fact, I may even have a serving of it along side my dinner. They say you need 5 veggies a day right? In a large bowl, beat together eggs, applesauce, sugars and 2 teaspoons vanilla. Mix in flour, baking soda, baking powder, salt, nutmeg and cinnamon. Stir in carrots. Fold in pecans if desired. Pour into prepared pan. To Make Frosting: In a medium bowl, combine butter, cream cheese, confectioners’ sugar and 1 teaspoon vanilla. Beat until the mixture is smooth and creamy. Stir in chopped pecans if desired. Frost the cooled cake. I absolutely love carrot cake and more often than not I leave out the nuts in my recipe too. Oh, but I don’t decorate mine with pretty carrots like you 😉 and I make them into cupcakes now and not a cake anymore. Aahh. You are definately a baker after my own heart. I too like my baked goods female (sorry that’s what we call them in our family- no nuts) and I always pick the raisins out of anything! I actually made carrot cake for my daughters first birthday cake. I didn’t want her to eat a high sugar cake. I used organic baby food pureed carrots in it. It turned out super moist and flavorful. Thank you for posting this recipe! I cannot wait to try it. Ha! I love the “female” distinction. That’s fantastic! It easily allows family to decide if they want one. As I walk in carrying a tray of baked goods like cookies or brownies they ask- “Are they Male or Female”? 🙂 Sorry not very PC for your blog. That’s totally great. I’m gonna share that (with your permission) the next time I do something with/without nuts. Tee-hee. Now every time I say that I’m going to think male/female. I love it. And, I’m pretty sure most of my devotionals are not PC. So no worries about that.